Less than a year after it last had a major makeover, the ARIA chart from this week in 1989 came complete with a brand new look - and corporate sponsorship! Coca-Cola came on board as the chart's sponsor and, as a result, every chart from this week on was the same shade of bright red. For anyone who'd quite liked the fact that the chart was a new colour each week - and always an unpredictable shade - the revamp took some getting used to. As we'll see in a couple of months' time, a small concession was made on the colour front, but the chart never looked or felt the same again. Not everything had changed this week in 1989 - The Beach Boys were still number 1 with "Kokomo", their fifth of seven weeks on top. The hits from Lap Of Luxury had definitely dried up, with Cheap Trick crashing and burning once again with this fourth single from the album - and that was despite it being co-written by superstar songwriter Diane Warren. A return to big ballad territory after the rockabilly stylings of their hit Elvis cover and the rocky feel of "Let Go", "Ghost Town" is a song that's only vaguely familiar to me now and is a bit miserable, so I can see why it didn't perform better. Every so often the ARIA charts from 25 years ago throw up a song I haven't thought about in years - and here's one I completely forgot existed until now. With Phil Collins off doing his solo thing again, Genesis bassist/guitarist Mike Rutherford's side project returned for a second album, The Living Years. "Nobody's Perfect" was the lead single, but ended up being overshadowed by the title track, which was released second and completely turned me off the group I'd quite liked up until then thanks to tracks like "All I Need Is A Miracle" and "Silent Running (On Dangerous Ground)". Of course, Mike wasn't the singer of the group - in fact, there were two: Paul Carrack (who'd also been enjoying some solo success in recent years) and Paul Young (no, not that Paul Young), who handles lead on "Nobody's Perfect". Here's another artist who'd been the second best known member of a major group - Cold Chisel guitarist and sometime singer Ian Moss. Ian's debut single, "Tucker's Daughter", was co-written with another former Chisel member, Don Walker (who we've seen fail to hit the top 50 on a couple of occasions with his group, Catfish). A number 2 for three weeks, "Tucker's Daughter" would end up being Ian's biggest solo hit - but we'll be seeing him return to the top 50 a couple more times before the year is out. Yet another new entry from an artist who'd previously enjoyed success in a well-known group - this time former Clannad member Enya. Or, Eithne Ní Bhraonáin, to use her birth name. "Orinoco Flow" had topped the UK singles chart in late 1988, and was one of those songs that was always going to be massive due to its combination of a catchy melody and complete uniqueness. It didn't quite reach the top here, but it did spend four weeks at its peak position. 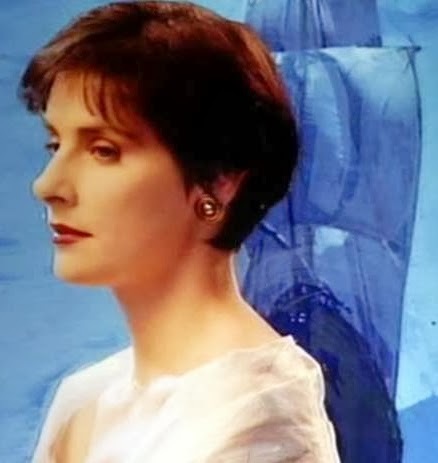 Enya very quickly became an albums artist rather than a singles act (although she would make a few more minor appearances on the singles top 50 in the years to come) - and is still capable of hitting the top 10 with a new album release. He'd passed away at the start of December 1988 just as his career was taking off again following his involvement with Traveling Wilburys, but The Big O had also completed what would become his final studio album, Mystery Girl, and "You Got It" was lifted as its lead single. Co-written with his Wilbury bandmates Tom Petty and Jeff Lynne, the track was a posthumous hit around the world - and in Australia was Roy's first major hit since 1969's chart-topper "Penny Arcade". Next week: ever wondered what it meant when "(30cm)" was written after a chart entry? Obviously it had something to do with the 12" version of a track, but we'll get to the bottom of exactly what it indicated thanks to one of the new entries. 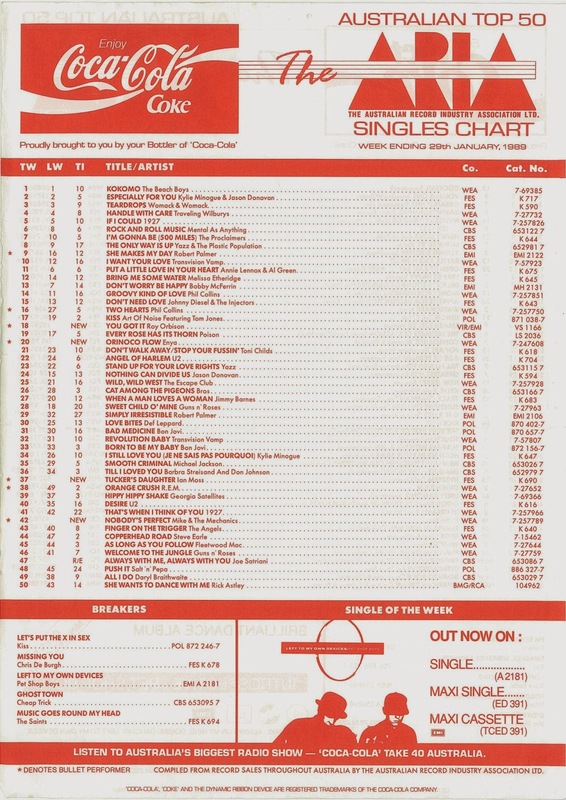 The first ARIA top 50 chart I picked up (a few weeks later) was this shade of red, so I was used to it/thought that this was how the chart always was... until someone sent me some old unwanted ARIA charts in the early 00's from before this period. I hadn't heard Cheap Trick's 'Ghost Town' until now, though I had seen the title before. I almost wondered if it was a cover of The Specials, but knew that that was unlikely. FM radio in Melbourne was flogging Mike & The Mechanics' 'Nobody's Perfect' several times a day for a month or so before its debut in the top 50, so I was a bit surprised it took as long as it did to dent the chart; though I guess they were (generally) the kind of act who would appeal more to album buyers. I imagine Sydney radio played it a lot too, and I do recall it - but I think my hatred for "The Living Years" tarnished it by association and made me block it from memory until now. I've just downloaded the song from iTunes. I didn't mind "The Living Years" in its day, but have hated it for a long time now. So bland and boring. "Nobody's Perfect" is a great track and one of those lost gems of the 80's. Funny, the compilation that would feature this song "Hits Now 89" the record has the song title printed as "Nodoby's Perfect" LoL. I bought Hits Now '89 at the time on cassette, but somehow never noticed, this. Ha ha.